The battle for Jerusalem is no longer fought in the trenches of the Judean Hills, but in courtrooms in the International Court of Justice in The Hague or UN conference halls in New York and Geneva. The Israeli Foreign Ministry has called the fight “diplomatic terrorism.” Others call it “international lawfare,” and as in any war, the first casualty is the truth. Friends of Israel need a strategy today to defend Israel from this web of vicious lies, slander, and manipulation of international law. The first step in such a strategy is to recognize the fact that the war is in progress and that Israel runs the risk of losing it. By using the tactic of “lawfare,” the Palestinians can pre-define their borders without ever having to bring the question to the negotiating table, simply by manipulating international institutions. Once Palestine is recognized as a sovereign member state in the United Nations, with east Jerusalem as its capital, the consequences for Israel will, of course, be disastrous. If there had not been a change of political direction in the White House in 2017, this prospect would still be on the table. Still, the new Trump administration will not be in place forever. Israel is threatened militarily on more than one front. However, this should not prevent us from also taking the “soft war” conducted by international lawyers, diplomats, and activists seriously. Their final objectives are no different from those of militant Islam, namely the destruction of the Jewish state. To prevent this from happening we need to take action now. Is Europe, where the “soft war” takes place most frequently, a lost case for Israel, or are there any reasons for hope? It is no secret that much of the political elite of Western Europe have chosen sides, and their sympathies are not with Israel. Their convictions, however, are not driven by international law or human rights. 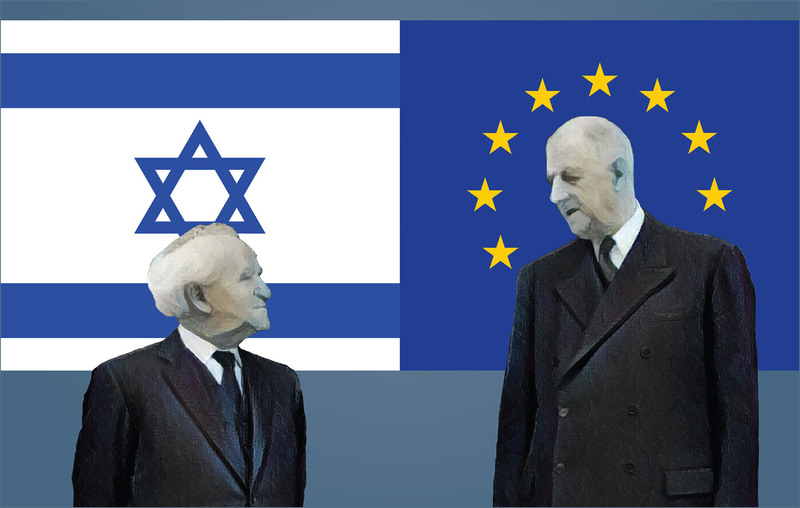 In fact, the first time the European Community formulated a common position on the Israeli-Palestine conflict was in 1973, after the Yom Kippur War and the subsequent oil embargo. Today’s EU position, which calls on “Israeli withdrawal from occupied Palestinian territories,” is a direct copy and paste from the Arab League’s plan. The EU statement was a clear act of appeasement toward the oil-rich Arab world, not a sudden “Eureka moment” in understanding international law. Forty years later, the oil weapon may have lost some of its clout, but Europe has a growing Muslim population that is quickly becoming a political force to be reckoned with. But when most observers only see the Muslim immigration into Europe, they miss the influx of Christian immigrants from Africa, Latin America, and Asia, who consider support for Israel a vital part of their faith. This growing constituency could become a strategic ally in the pro-Israel camp in Europe. Another factor that may work in favor of Israel is the current soul-searching within some of Europe’s intellectual classes. Faced with the threat of radical Islam, some have re-discovered Europe’s Judeo-Christian heritage, perhaps not as a vibrant faith, but as a cultural marker. In the Visegrad countries, in particular, opposition to receiving Muslim immigrants has been motivated by the need to preserve the country’s Christian character. The Czech Republic’s president and close friend of Israel, Milos Zeman, has been a vocal proponent of this theory. Ironically, the Czech Republic is one of the most secular countries in Europe, but, as a cultural marker, faith is now becoming an important asset. The church in Europe has often been considered a sleeping giant. As long as there were no immediate threats on the horizon, the church was mostly at ease. Today, the church is increasingly squeezed between militant Islam on the one hand and radical secularism on the other. Could it be that Europeans could again find attraction to the church as a rallying point for identity and hope? The role of the Roman Catholic Church in Poland and the Reformed Church in Romania in bringing down the Iron Curtain is well documented. Could the church once more become a force for social change? When the EU leaders presented their ambitious Lisbon Treaty in 2007, there was no mention of Europe’s Judeo-Christian past. Since then, there has been a clear shift. Nobody illustrates this shift toward religion better than Austria’s new Chancellor, the 31-year-old Sebastian Kurz, who is a practicing Roman Catholic and has expressed open support for the Jewish state. Furthermore, the junior partner in the government considers Jerusalem to be the capital of the State of Israel. If Sebastian Kurz is the future of the largest political entity in Europe, the Christian-Democratic movement that he represents, then Israel has a bright future also in Europe. But Kurz also illustrates a great dilemma that Israel is facing. After having formed the most pro-Israel government in the history of Austria, the government in Jerusalem long refused to talk to Kurz’s adminstration due to the fascist past of its junior government partner, the Freedom Party. Still today, European Jewry keeps a cool distance. How Many Legions Does the Pope Have? For the last 15 years, I have been privileged to lead a Christian organization called European Coalition for Israel. As people of faith, our first calling is to pray for the peace of Jerusalem. Though some may smile at this rather unorthodox approach to international lawfare, they would do well to remember the lessons of the Cold War. Soviet dictator Joseph Stalin once sarcastically asked his advisors, “How many legions does the Pope have?” implying that the religious leader lacked any real influence. A few decades later, the Communist system was brought down by a Catholic workers’ revolt inspired by the late Pope John Paul II. The Pope and the Christian workers had no military power, but they had the gift of faith, prayer, and perseverance to stand for what they believed to be the truth. In an increasingly hostile environment in Europe and around the world, we need these same qualities. There is a reservoir of hundreds of millions of Christian believers around the world who love Israel and want to speak on its behalf. It is no secret that this constituency has been the driving force behind embassy relocations to Jerusalem both in the United States and in Guatemala. If African nations are soon to make the same move, it will again be thanks to these first-generation Christian believers. In his groundbreaking book “The Next Christendom,” Phil Jenkins asserts that by the year 2050, only one Christian in five will be a non-Latino white person and that the center of gravity of the Christian world will have shifted firmly to the Southern hemisphere. In 1980, more Christians were found in the global South than the North for the first time in 1,000 years. Today, the Christian communities in Latin America and Africa, alone, account for 1 billion people. Over the past 100 years, Christians grew from less than 10 percent of Africa’s population to its nearly 500 million today. One out of four Christians in the world presently is an African and the Pew Research Center estimates that this will grow to 40 percent by 2030. The global picture would not be complete without mentioning China. In 1949, Christianity was banned in Communist China. Today, there are between 70 and 100 million believers. It is estimated that, even with a moderate growth rate, the number could grow to 250 million in 2032, which would make it the world’s largest Christian population. What does this have to do with Israel? What characterizes these first-generation Christians (in comparison to nominal Christians from the West) is their almost literal belief in the Bible, including God’s everlasting covenant with the Jewish people. This genuine appreciation for Jewish culture and heritage can no longer be found in most of the historical Christian denominations in the West, which instead are promoting BDS and other anti-Israeli policies. These religious denominations have experienced a long period of secularization and are today losing both members and influence. There are today three times more Protestant Hispanics in the United States than Episcopalians. Whereas the Episcopal Church has been championing boycotts against Israel, the Protestant Hispanics recently formed the Hispanic Coalition for Israel to better articulate their support for the Jewish state. This same trend can also be seen in Europe, where the so-called ethnic churches (consisting primarily of people born outside Europe) today make up the largest local churches in many, if not most, major European cities. In London, the Nigerian-led, Christ the Redeemer Church brings together more than 45,000 worshippers for all-night prayer meetings. (In Nigeria, the same church is reported to bring together over a million worshippers at similar prayer meetings.) Out of the ten largest local churches in London today, the majority are African. How can this translate into growing support for Israel on the international arena? Sooner or later, this changing trend in Global Christendom may also translate into growing political support for Israel on the international arena and in particular in international organizations, such as the United Nations. But this will not happen automatically, and it needs a strategic push. Religious believers need to bridge the gap between what they conceive as “Biblical Israel” and today’s modern and secular State of Israel. Official Israel, on the other hand, needs to be sensitized to this group of Evangelical supporters who feel as equally strongly about family values and life issues as they do about Israel. The Biblical supporters of Israel lack nothing in passion and enthusiasm but need to also understand the legal arguments for the State of Israel and its position as a modern secular society. In other words, Israel is legitimate, not only because the Bible tells us so, but because it has legitimacy under international law. For these new Christian legions to become a potent political force, there needs to be training and mobilization. In many Latin American countries, the growing church is currently undergoing a similar development as in the United States in the early 1980s when the so-called Christian Right helped propel Ronald Reagan to power. Similar to the United States in the 1980s, the Evangelicals in Latin America and Africa today have the numbers to help influence national elections. Change at the United Nations? The potential for a stronger Christian pro-Israel influence on the international arena is real. Nowhere is this more needed than at the United Nations General Assembly (UNGA). Today, African countries in the UNGA are organized in several regional groups who remain hostile to the interests of the Jewish state. Apart from the African Union, the Organization of Islamic Cooperation, Non-Aligned Movement, and the Group of 77 play an important role in defining the voting pattern for many African nations at the United Nations. However, in recent years there has been a crack in the facade, as some countries have broken rank with these groups. However, to become a more potent force at the UNGA, they would ultimately need to create a new group. Also, the African Union could change for the better now that Libyan strongman Qaddafi no longer exercises economic influence over the region. Today, South Africa still poses a problem by consistently keeping Israel out of the African Union as an observer state. But given Israel’s growing presence in some African countries, this attitude is no longer sustainable, and sooner or later we can expect a warmer embrace of Israel. Also in Latin America, the tide is turning toward Israel. It is no coincidence that the two nations who were the first to follow the U.S. decision to relocate their embassies to Jerusalem after the United States were from Latin America (Guatemala and Paraguay). Several other Latin American nations, such as Brazil, are currently considering a similar move. It is no secret that the Evangelical movement is at the core of this quiet revolution. If this global trend continues, and research seems to indicate that this is the case, we may soon see a paradigm shift also in the United Nations General Assembly, where the eight “permanent” supporters of Israel could soon become 80 if and when the Global South rallies behind Israel. Whereas the historical church in the West still controls global institutions, such as the World Council of Churches in Geneva, they have recently had to scale down their activities, due to lack of funding. In the Southern hemisphere, the church may currently lack the international clout which comes over time, but it has the numbers, and it represents the future. With the help of these new Christian legions, Israel’s diplomatic war can be won.